Worth waking up in the morning. Challenging in all the right ways. Last week made a year since The Hubbz and I said *I do* and it’s been a year filled with living, loving and learning. Who would’ve known that two people who had given up on love, who never believed in fairy tales, who faced all the challenges life sent their way would feel like love-struck teenagers ever again. We got to know each other before we ever met and when we did, we knew almost instantly we would see each other every day for the rest of our lives. On our first official date we decided to cook together, it seemed only appropriate we did the same for our first anniversary. Want to know what was on the menu? I can’t really explain how incredibly good these were, and so easy to put together. 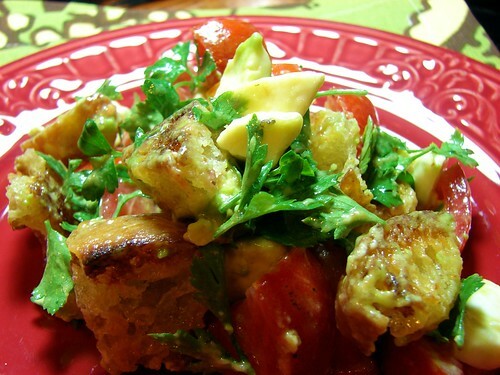 The salad was a no-hassle toss together kinda deal, and the parsley made it so fresh and crisp. 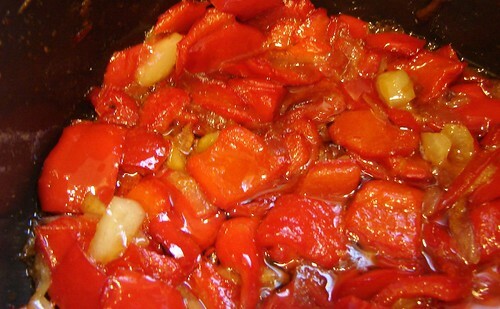 Then the red pepper confit was out-of-this-world good. I swear I could take a tub of that and eat it on its own! Cube 4 slices of ciabatta (or other bread you like) into 1-inch cubes and toast them in a nonstick skillet with some butter and olive oil. Set aside and allow to cool. 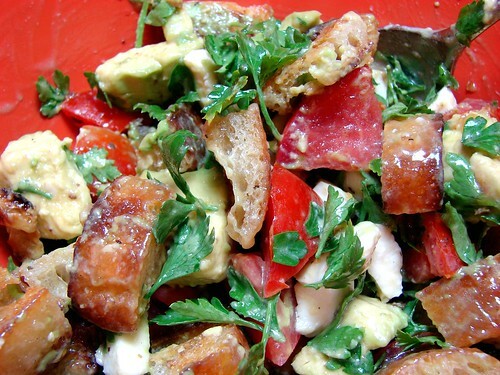 Add the cooled bread and toss with 2-3 tbsp of your favorite vinaigrette. Serve immediately. Add all the ingredients to a medium saucepan over medium heat and cook until the peppers have softened completely (about 30 minutes). 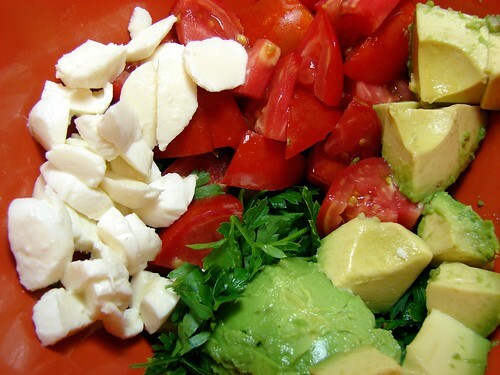 Allow it to cool for about 15 minutes before pureeing it–use a blender or a small food processor. 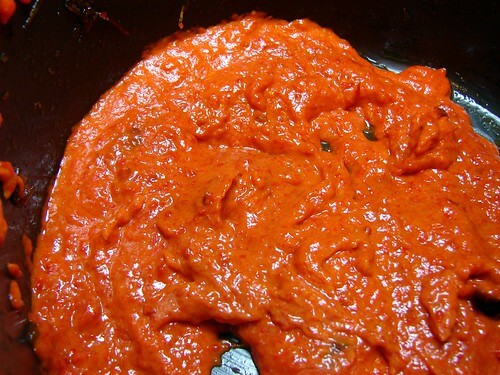 Return it to the saucepan and add a bit of broth or water to thin the puree. Keep warm while you cook the scallops. 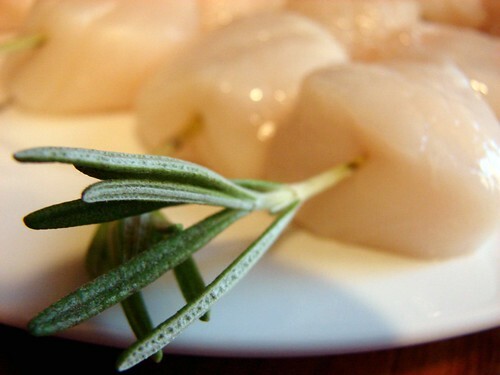 I used the rosemary stems and skewered 2 scallops on each one. You can skip this step if you want. Heat a nonstick skillet on high and add about 1 tbsp of oil. 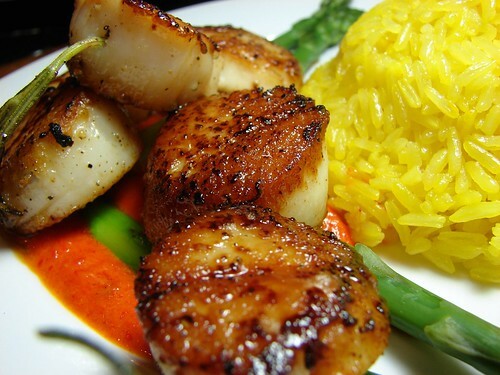 Make sure the scallops are dry and sprinkle with a bit of salt & pepper and sear them on the skillet. About 2 minutes per side, should be enough for medium-large scallops. Set aside and keep warm. To plate: I wanted to preserve the crust on the scallops, so I blanched a few asparagus spears to put between the sauce and the scallops. 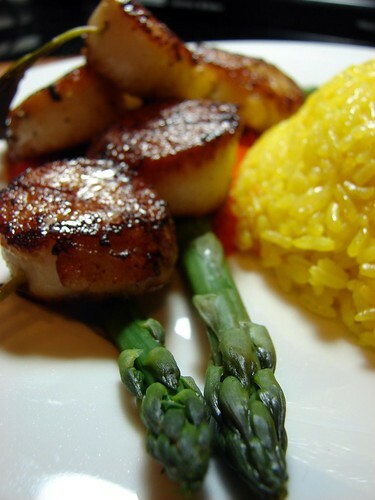 Spread about 2 tbsp of the pureed confit, lay a few asparagus, then top with the scallops. I. Love. Scallops. nom. nom. nom. 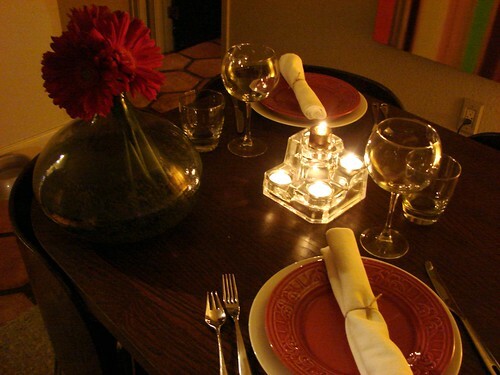 Lovely dinner for a special occasion like a first anniversary. Congratulations! Congratulations! I just had my third. What a wonderful romantic dinner. I love scallops too. never ate scallops. what do they taste like? looks great! A beautiful testament to your year. Lovely and delicious looking. See, love ain’t so bad. Wishing you many many years of happiness!! 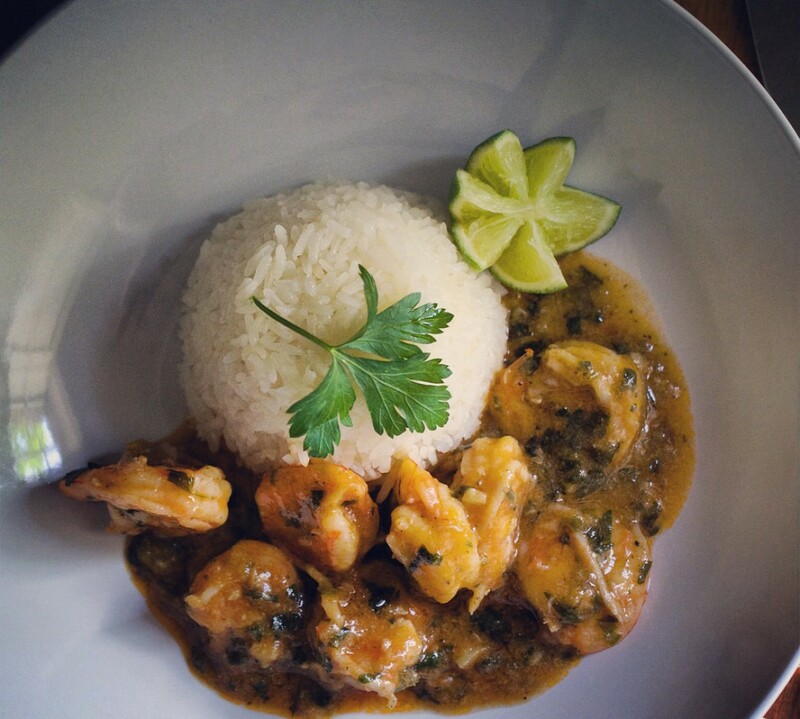 Your food never ceases to amaze me. I can almost smell it through the screen.